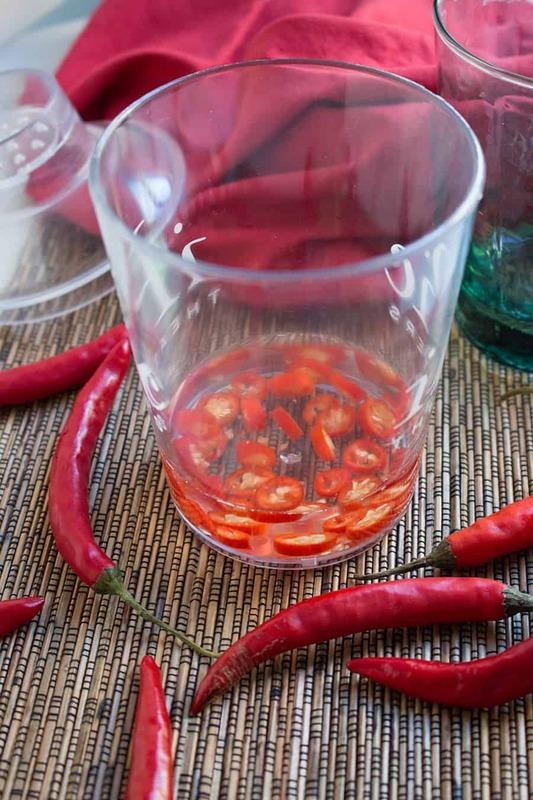 Learn how to infuse alcoholic beverages with chili peppers to bring a spicy kick and flavor to your favorite drinks. Includes several powerful recipes. Chili peppers go great with any type of food and you can highlight them in so many ways. Recently, a trend is to infuse alcoholic drinks with chili peppers, which is a trend we greatly enjoy. You can do this at home. 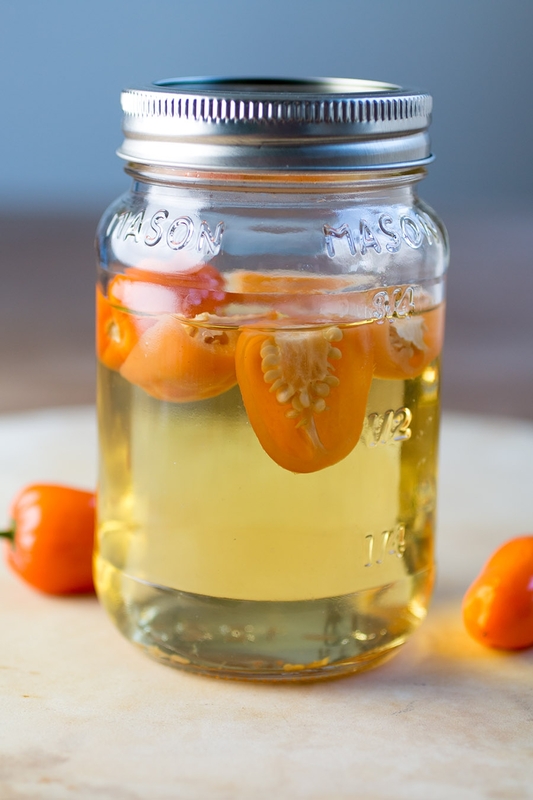 The process is very similar to infusing vinegar with chili pepper heat and flavor. In general, always choose the freshest chili peppers for your infusions. Dried chili peppers also work great. Wash the peppers and slit them lengthwise so they do not float. You can also chop them into smaller pieces for a stronger infusion. Habanero peppers are ideal for infusions as they pack a great deal of heat and flavor, but you can realistically use any type of chili pepper, like the fabulous jalapeno or the smoky chipotle. Slice the chili peppers and drop them down the neck of the bottle you wish to infuse. You may need to make a bit of room. Your choices of alcohol are limitless, but popular choices are tequila, vodka, and even wine. The amount of chili peppers will depend on your preference, though you can use anywhere from 1 chili peppers for a milder infusion to a dozen for a flavor blast. 2 to 3 peppers are typical. The chili peppers will eventually sink and your infused alcohol will be ready for consumption in anywhere from several hours to 3 or 4 weeks. The longer you let the peppers steep in the alcohol, the more chili pepper flavor and heat you will get, though eventually, the peppers can begin to break down if they are left in long enough. If you want your pepper infused booze to last longer, strain out the chili peppers and cap the bottle. This will let you keep the alcohol for much longer, to be used in all of your favorite cocktail recipes. Can I Infuse a Single Drink with Peppers? Absolutely. 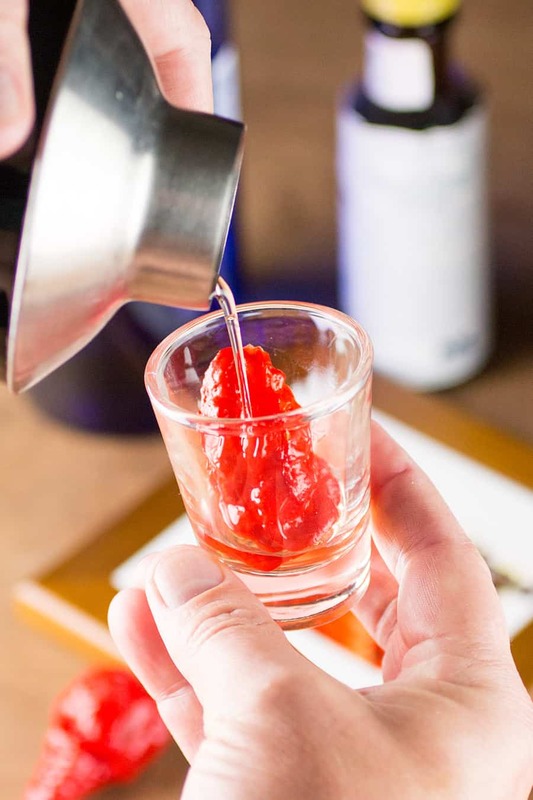 One of my favorite spicy sippers is to take a half of a superhot chili pepper, such as a Carolina Reaper or a Brain Strain and add it to a shaker with several ounces of either vodka or tequila. Give it a few shakes. Let it steep for a couple minutes if you’d like. The superhots will infuse heat very quickly, so be forewarned. Pour your shot or drink and enjoy. It’s a nice level of heat! Try this Scorpion Tongue Vodka Shot Recipe. Nice and spicy! Chili Pepper infused alcohol is great for mixed drinks like the famous Bloody Mary or the wonderful Margarita, though they also work great to incorporate into sauces and other meals. Sometimes I enjoy a very simple tequila that has been infused with fresh jalapeno peppers. Absolutely delicious. So my tequila’s infused to my satisfaction, but it seems such a waste to simply toss the peppers. Any thoughts about how they could be used in a subsequent dish? Hey, Sheri. You don’t have to toss them. You can either cook them into any dish where you’d normally use them (with a little tequila flavor!) or dehydrate them to grind into an interesting seasoning powder. That’s what I often do. Happy to explore other ideas, too! I wanted to experiment with jalapenos in tequila after having a few jalapeno wine shots during a women’s wine weekend. I put a cup of tequila in a jar overnight with one slice jalapeno, including seeds. The next day I made a margarita with it and it tasted great. Quite spicy, but not overpowering. For me, anyway. My husband thought it was way too spicy. Your recipe says to let it sit 2-3 weeks!! How will the extra time affect the flavor? Spicier? More flavorful? Am I just more of a wimp than I’d thought? Joni, a day is plenty of time to get some infused flavor, but yes, if you leave them in longer, you’ll have a stronger infusion. Glad you liked it! A day is probably good enough for you. Perfect! I just dehydrated 1/2 gallon of sliced Carolina Reapers. I plan to cram as many as possible into a bottle and cover with 151 proof. I will allow diffusion for several months and the pour the infused ETOH into a eye dropper bottle for infinite storage as a tincture. The drained chili peppers bottle will be refilled with more 151 proof. REPLY: This sounds awesome, Dan! I love it. — Mike from Chili Pepper Madness. REPLY: It’s hard to say because pepper sizes vary. 3 large bell peppers are about a pound total, so consider accordingly. — Mike from Chili Pepper Madness. REPLY: Scott, you can use either, but I find that fresh works best. Cheers! — Mike from Chili Pepper Madness. I just made a Bhut jolokia aka ghost pepper Vodka. I used a fresh chopped up whole pepper without seeds and left it in the vodka for only a couple of hours with mild results. Will made another one but with more chilies and leave it much longer. Thanks for stopping by. Since this would be your first time, you might try the infusion with only 1 or 2 peppers for the whole bottle and see how that tastes to you. You don’t want to overdo it, depending on your palate and heat tolerance. Also, put a slit in the pepper to help the infusion process. You can also slice it into rings or pieces, but the whole peppers with slits look a bit more appealing, imo. I had a pepper infused rum recently and I want to make it at home. I will use a fresno (or similar) for one bottle (750ml) what would be a good amount of chili’s to use – I want it to have a good bite but not so much that it overpowers. Also – should I put the pepper in whole or slice it?